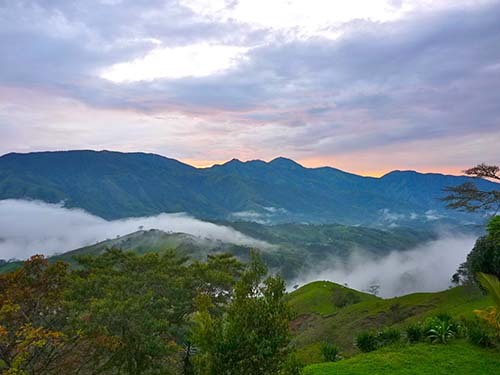 The entire property provides for a protected, enclosed feeling created by the stunning surrounding hills and valleys. The property has been divided in two sections; a residential area of freehold lots, and a Common Area of some seven acres. The residential area has it’s own gated entry and consists of 10 titled lots varying from just under an acre to over 2 acres. At this point 6 lots have been sold and 4 houses have been built, leaving 3 lots still available (numbers 1a, 1c, and 4 on the map below). Lot 6 and 10 have a separate entry gate from the other lots.. In keeping with the village concept we have reintroduced a Village Commons. This second section of Common Area consists of a huge nature reserve of tropical rainforest and a magnificent orchard, both together are 7 acres in size. 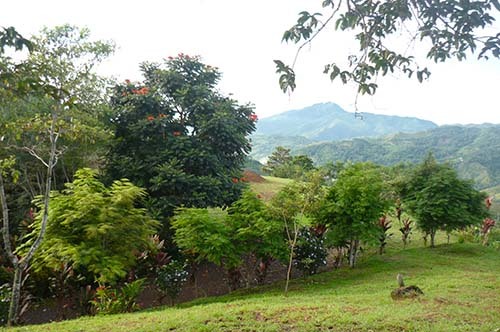 The orchard and walking trails have been planned on a Permaculture basis, and have already been planted with mango, avocado, pejibaye, maracuya, cas, cashew, guanabana, lemon, orange, sweet mandarins, banana and papaya trees. As well there are now sufficient coffee plants to produce about 200 kilos of the best Arabica coffee each year; enough to keep the community buzzing through the year! 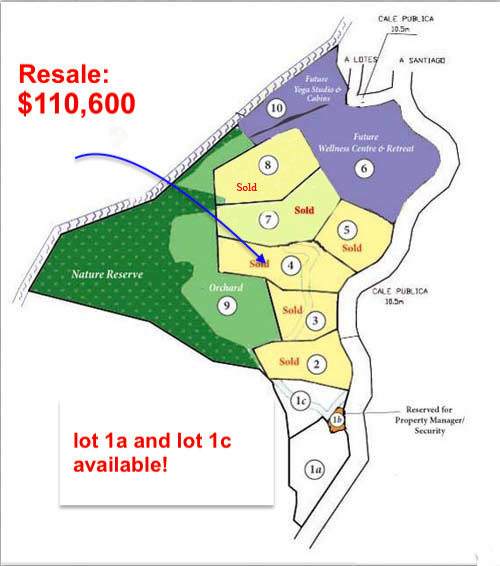 Here are the current prices: lot numbers refer to the lot layout map below. Please note: All lots complete with public utility water supply. Final electrical connection to the public street will be at buyer's expense.